Precautions for a Technician to think about if the HT ignition leads are suspect of creating a misfire. 1. Distributor Ignition system, with or without internal distributor ignition coil. (A superseded system but still many on the road). 2. Distributor-less Ignition system utilising Block ignition coils or packs. (with or without integrated modules). 3. Individual ignition coils - not coil over plug. Are all HT leads the same? The type of vehicle ignition system, and whether for standard or modified applications, plays a big role in the requirements for the ignition leads. With a high-tension spark of up to 36 - 40kV supplied to the spark plugs of a typical modern engine, it is important that the HT leads meet several performance requirements. (Coil over plug system may develop up to 60kV). Chemical resistance – salt water, oil, petrol and acids. High mechanical strength -Resistance against vibration, humidity and temperature variations. All these properties are required to perform for the whole life of the product. Any premature failure can create misfiring that can destroy catalytic converters and other expensive engine related components. Typical quality HT ignition lead construction: This may vary to suit specific ignition systems and applications. Typical HT lead sizes generally – 5mm – 7mm – 8mm and 8.5mm for high performance insulation. A “good quality” set of HT leads not only reduce the possibility of causing a misfire and fowled spark plugs but also controls the annoying crackling sound that is generated through the AM band of the vehicle radio and possibly through the FM band. The REV limiting action of the ignition can also be affected by RFI and in some cases the ABS system has also been known to be affected. Note: The use of a dielectric grease on both boot ends of the HT leads can also reduce RFI by reducing the moisture content around the HT contact areas that will result in reduced voltage leaks. Recommended also for coil over plug applications. A separate condition created by varying loads on the vehicles 12V supply line voltages can be amplified through the vehicle radio 12V supply wire and audible through the radio speakers. The use of radio suppressors or noise capacitors typically fitted to - ignition coil primary circuits or alternator output terminals generally control this condition. The HT lead resistance is only one test to be carried out to eliminate any open circuit conditions both for HT leads that have been in service for long periods and also to verify that the replacement new lead sets are suitable for service. Note: An open circuit HT lead is not to be fitted to the vehicle. The HT lead resistance values will vary depending on the material type used and the length. Typical original equipment HT leads may be rated as 16,000 Ohms per metre. (R16 may be stamped on the lead). There are many variations to this specification, depending on the application. 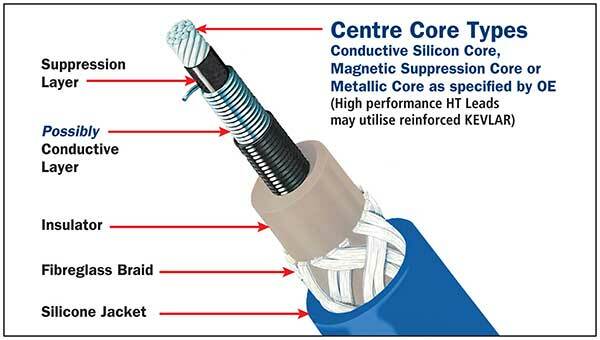 Typically, may be the stainless-steel Ferrite Spiral Core rated at 1300 Ohms per metre. It is important to ensure that the correct “quality” HT lead sets are used for the specific application. We all know that Interpreting a tune scope pattern during an engine running condition is the most accurate method for diagnosing a suspect ignition system fault. We also know that it is not a surprise that many of the tune scopes in a workshop sit and collect dust from lack of use. No matter what the reason, workshop time constraints have created the need for quick reliable and simple test equipment to assist in the diagnostic test procedure. 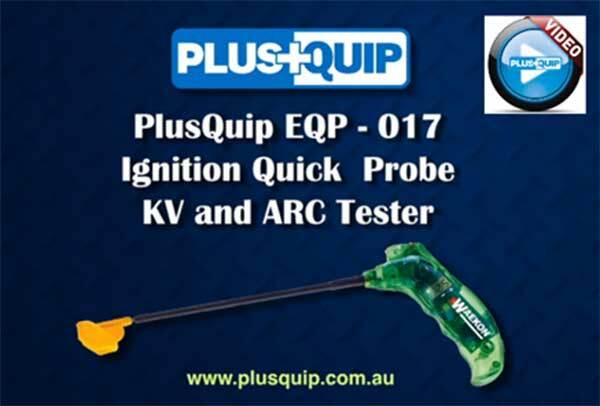 A typical piece of equipment that can assist in the testing of the secondary spark area is the PlusQuip EQP-017 - Ignition quick probe – KV and ARK tester. Refer to demonstration video here. Typical HT Ignition Lead faults that require attention. These may be damaged due to overheating from engine area or exhaust. Heat shields must not be removed if area affected by extreme heat. Terminals separating from leads during removal. Always remove leads from the boot NOT the lead itself. The use of dielectric grease also prevents the boot sticking to the spark plug during the removal process. Generally, where incorrect HT lead lengths are fitted and may rest on the manifold or exhaust. Ensure engine degreasers are not sprayed directly on the boots or leads. Battery acid must be removed from any lead to minimise cracking and splitting. Voltage tracking down spark plug. Replace spark plug and HT lead with attention to correct spark gaps. Ensure dielectric grease is used at the boot to prevent moisture entering. Ensure HT lead terminals correctly contact the spark plugs and Distributor cap / Ignition Coil. The Premier Auto Trade Ignition range includes more than 386 Ignition Lead Set part numbers from the world’s leading manufacturers, covering over 4 million vehicle applications in Australia and NZ.